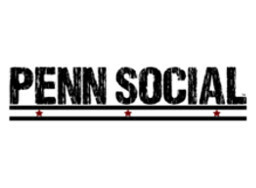 Penn Social has been voted City Paper's "Best Bar Games" and trivia night is no exception. Housed entirely on the main floor the trivia crowd takes up all of the available regular seating and all of the patio furniture that they drag inside to accommodate the players. The crowd averages between 75 players with the last few stragglers relegated to standing for the entirety of the game. Show up 15-20 minutes early to get one of the last seats in the house or 30-45 minutes early for your choice of tables. 10 minutes makes all the difference in the world.